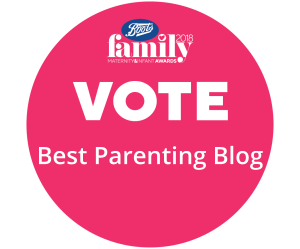 Eeeekk, I am in the running in the best parenting blog category in the Boots maternity and infant awards 2018! It is a public vote and whilst I am cringing at the thoughts of asking for some votes from you all , I am hiding behind my fingers whilst doing so. I am completely aware I am in the toughest category with lots of lovely and amazing parenting writers but sure look it would be lovely to get to the next stage of the voting if I can.